Biggest game(s) of the season. Biggest game(s) of the decade. Biggest game(s) in maybe forever. Copa Libertadores Final 2018 will be played over two legs on November 10th and November 24th. It deserves its own thread as it's by far the best thing that happened to the sport. River gets the crucial final game at home due to higher coefficient rankings. Former Inter players' association with these clubs. *Batistuta played for both sides before moving to Europe. *Nelson Vivas came from Boca to Europe, returned to Argentina for River. *Sebastian Rambert never played for Inter iirc, but we loaned him to Boca and then we released him to River on a free. The only current player of Inter that's related to these clubs is Facundo Colidio, former Boca Juniors player at youth level. Last edited by brehme1989; 10 Nov 18 at 21:42. Did they played first leg yet? November 7th was yesterday. That was the original date. November 10th and November 24th. The first leg is on the tenth btw not the 7th. Thought id missed it for a second. The second leg is going to coincide almost directly with the Frosinone game (18:30 CET vs. 19:00 CET) so plan accordingly. No such issues for the first leg. EDIT - check that. 2:30pm ET and 3:00pm ET translates to 20:30 and 21:00 CET, respectively. Oops. Last edited by Kramerica Industries; 08 Nov 18 at 21:15. A young Esteban Cambiasso scores for River Plate's massive away win. Boca-River 3-0 in the 2000 Copa Libertadores quarter finals. Boca triumph with Juan Roman Riquelme showing the world his greatness. Boca won the tournament after PKs and then they went on to beat Real Madrid in the 2000 Intercontinental Cup. River manage to beat Boca but still could not reach them for the Championship in 2017. 2015 was River's year with an epic Copa Libertadores trophy after the recent nightmares, but the Superclasio at the Bombonera was Boca's. The game is postponed due to heavy rain. Not sure when is the rearranged date. Time has changed, it's 20:00 CET (Inter time). Can you put the dates and times under the 2 LOGOS and the VS before the info u added. By the way, not sure if many realize this, but the Copa Libertadores Final will stop being played over two legs after this one. It will most probably be held the same way the Champions League is, with a pre-determined host. It couldn't have ended in a better manner. Except for the rain that fucked us hard of course. A random fact. Today's Genoa's stadium flooding and today's final postponement are indirectly related. 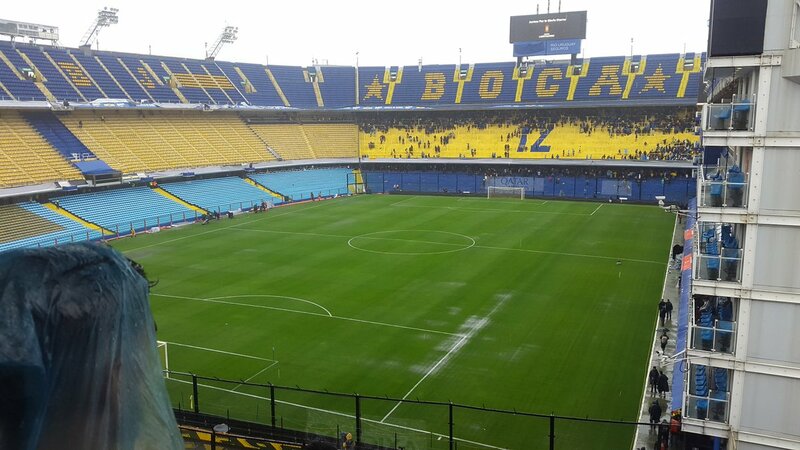 The Boca fans are called Xeneizes. Which translates to "Genovese", the Genoans, as the Boca (meaning mouth) part is the dockland area of Buenos Aires were many Italian immigrants from Genova used to live and work. Today I was able to get into the stadium, and I watched both referees walking around the field and testing the ball, and sadly it was impossible to play. I'm so hyped like you are, like everyone is here. People are mad, you should watch some videos of fans, streets were flooded, but it didn't matter, it's a unique event in the history of football and I feel so lucky I will be there. Would be great if you could share some stuff with us about this since you're a local and a Boca fan. I really wonder how fans of San Lorenzo, Racing and Independiente feel right now. What do u think about no away fans in both legs? also like Breheme said feel free to post stuff if u want! Meh, sadly we got used to games with no away fans, ever since 2014 or so, when a Lanus' fan died in Estudiantes' stadium against el Pincha. A few years ago, away fans slowly started to return in a few games per weekend. 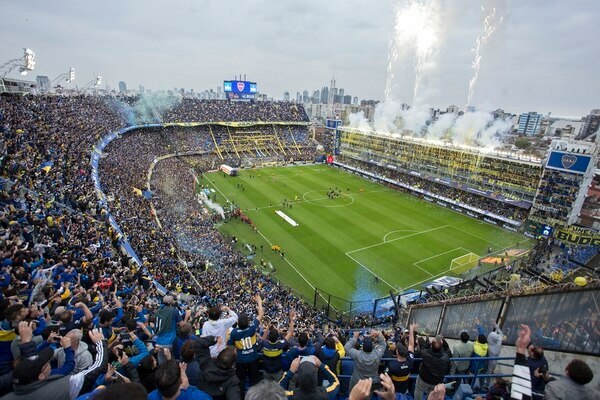 Nevetheless, we do have away fans in Copa Argentina matches, and last Supercopa Argentina final had fans of both Boca and River. Btw, just out of curiosity, will you watch the game? Does the TV in your country broadcast the game? Last edited by R.Palacio8; 11 Nov 18 at 03:36. Ya in Egypt people usually watch it through cable, it was Bein Sport [which was Al Jazeera sports] in the past but now Abu Dhabi Sports has it, they do the whole middle east and Asia. In the US fox sports has usually broadcast it. I will definitely be watching it. Like i said this is a match that will prob never happen again in the near future, i haven't watch Boca play in a long time, the last time i did it was prob when Palacio was there. Boca's goalkeeper is Esteban Andrada, former Lanus who actually played for them last Libertadores' final against Gremio, but he was seriously injured against Cruzeiro during the first quarter-final leg. He may return for the second leg, but for now our goalkeeper is young Agustin Rossi, not a very realiable keeper. Nevertheless, people try to give him confidence. Our midfield has Nandez and Barrios, both nationals for Uruguay and Colombia, respectively. Both played the World Cup, not like Pablo Perez, our captain, who got in the bench for some Argentina's matches but didn't jump onto the field. Pavón was a called for the World Cup and played a few games for Argentina. I think Villa did not play for Colombia during the World Cup, but he has a great future and will definitely be called. Finally, Ramón "Wanchope" Abila (nicknamed after the great Costa Rican forward who played for Man City, West Ham and Málaga) is just one step ahead of Dario Benedetto, another national for Argentina in a few games. river's goalkeeper is Armani, Argentina's goalkeeper in the World Cup against Nigeria and France. river's coach is Marcelo Gallardo, played for Argentina in 1998 World Cup and played some years in France, I think he played for PSG. Thanks for the infos man, really appreciate it. Keep us updated will ya?